Geographically, Bali lies between the islands of Java and Lombok. Stretching approximately 140 km from east to west and 80 km from north to south, Bali is one of more than 13,500 islands that make the Indonesian Archipelago. Lying just 8� south of the equator, Bali boasts a tropical climate with just two seasons a year and an average annual temperature of around 28� C. The rich volcanic soil and healthy monsoon season make this island extremely fertile and a range of crops are grown here. Bali is famous with terraced rice paddies, among the most spectacular in the world ; coffee, copra, spices, vegetables, cattle and rice. Bali is also well known as the "Island of the Gods", where temples and ceremonies can be found almost everywhere and everyday. The majority of Balinese are Hindus. Although they have a caste system, Balinese Hindus are very different from the ones in India. Religious life in Bali is almost inseparable from cultural life. One of the daily rituals is presenting offerings. Offerings play a significant role in Balinese daily life as they appease the spirits and thus bring prosperity and good health to the family. Located in the tropical zone, Bali enjoys an average year-round daily temperature between 20�  33� 0 Celsius. Fluctuations do occur but they are minimal. Balis climate is also characterized by high humidity, around 85%, because of abundant rainfall and high temperatures. Here in Bali, only two seasons predominate, a dry and a rainy season. Rainy season lasts from December to March, whereas dry season from May to October with the transition period between October and December, known as Musim Pancaroba, characterized by changing winds and inconsistent weather. Nusa Dua located in southern part of Bali. 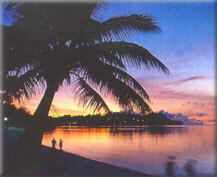 It is an exclusive area of several five star resorts with white sand beaches, pristine water and coconut trees. Neo-Balinese architecture buildings combined with beautiful landscape design makes this well designed area a real tropical paradise.